Wow, I slept. All. Day. I barely managed the manicure for today with no hope of catching up on the GOT or Bundle Monster challenges! Yikes! Hopefully, if I can’t catch up I can pick up them up again. Anyways, I couldn’t think of anything other than a sponge gradient which I saw many other people did so I decided to up the ante and do a double sunset gradient with the sponge AND sugar-spin technique! Hehehe.. I like the opposing and opposite color gradients and I hope you do too! I used a makeup sponge with (from cuticle to tip) Color Club Almost Famous, Wham! Pow!, Warhol, and Mrs. Robinson. When I was happy with the results I sugar spun with the same polishes (minus Mrs. Robinson) in the opposite direction. 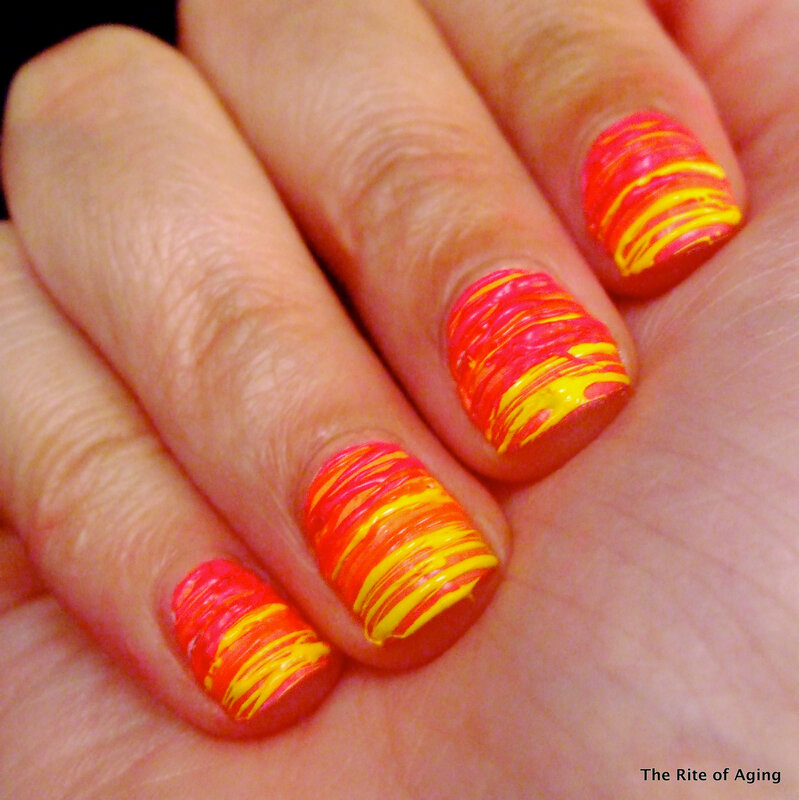 Don’t forget to check out the other Sunset manis! Love the look of this. It remindes me of the snset reflecting off of the lake. Very Cool! So beautiful! I love how you’ve done this mani! Thank you! I had a ton of fun with it, got to practice my gradient skills and my all time favorite sugar-spin! This is so cool and different! Love it! Thanks! I really love sugar-spins! !